Spray Polyurethane Foam (SPF) is an amazing material with applications across numerous industries, including pipeline installation. SPF can be especially useful when pipeline trenching work takes place in rocky, uneven or steeply inclined terrain. When these conditions are encountered, some sort of pipeline trench support is required. Sandbags have traditionally been used to construct trench breakers, but our spray foam crew can do this work faster, more affordably and with superior results. Contact the experts at Total Foundation Solutions to schedule an appointment and installation quote. We serve commercial clients throughout Pennsylvania and New York, including Erie, Edinboro, Warren and nearby. Give us a call today! See PolyLevel® Trench Breakers in action and learn why it's the superior alternative to sandbags for pipeline installation. Fast. There’s no faster way to install trench breakers. Affordable. Lower installed cost than sandbag construction. Non-damaging. Spray foam expands to fill voids around exposed pipe, providing a cushioning effect. Long lasting. Cured SPF is stable, strong and waterproof. Versatile. SPF application can also be used as a rock shield, pipeline pillow support & pipe insulation. The 2-part foam used in geotechnical applications has unique characteristics that provide important advantages in trench breaker construction. When the SPF resin and catalyst compounds are mixed at the application nozzle, the resulting chemical reaction turns the liquids into expanding foam with excellent adhesive qualities. 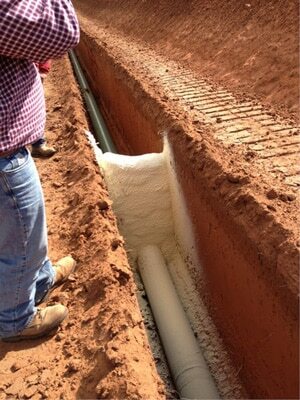 The foam penetrates into loose soil and bonds to the sides of the trench excavation. The foam expands, hardens and cures within minutes, making it possible to complete each trench breaker in a fraction of the time that a larger crew would require to build with sandbags. The cured SPF support is inert, environmentally safe, and immune to moisture damage. Our SPF system is compact and portable; we don’t need heavy equipment to transport tons of sandbags. SPF has what it takes to keep your project moving. To schedule a free consultation, contact the experts at Total Foundation Solutions today. Our pipeline trench breaker services are available in Edinboro, Erie, Warren, Jamestown, Fredonia, Meadville, Du Bois, Harborcreek, Hermitage, Olean and throughout the surrounding area. Speedy, safe & sure. Spray foam trench breakers eliminate the need to handle heavy sandbags, providing solid, durable support to keep pipeline projects running smoothly.